A new Stride and Sentinel that support Unite centric Gold Paladin Decks appear! AUTO Unite: When this Unit is placed in the G Zone from (VC), Counter Charge 1/Soul Charge 1. CONT (VC): For each of your Rear-guards, this Unit gains Power+3000. AUTO: [Choose 1 card from your hand, discard it] When this Unit is placed on (GC), you can pay the cost. If you pay it, choose 1 of your Vanguards being attacked, during that battle, it cannot be hit. AUTO Unite: [Choose 1 of your Rear-guards, place it on the bottom of the Deck] When this Unit is placed on (GC), you can pay the cost. If you pay it, during that battle, this Unit gains Shield+15000. For Today’s Card, we’re introducing from the 10th Booster Pack “Raging Clash of the Blade Fangs” (on sale February 3rd), 2 cards with 《Gold Paladin》’s 【Unite】 ability, the G Unit “Golden Dragon, Build Peak Dragon” and the Sentinel “Holy Mage, Alessia”. 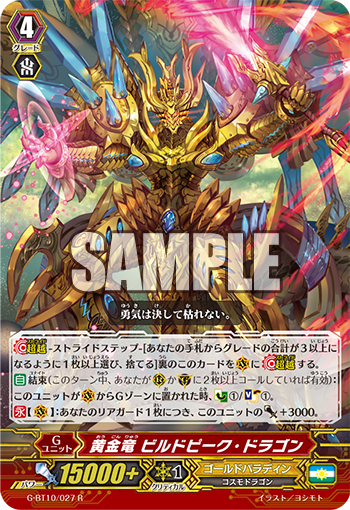 “Golden Dragon, Build Peak Dragon” is a G Unit that specializes in recovering costs. To fulfill 【Unite】, the you need to Call 2 Units to the Rear-guard Circle or Guardian Circle! And when Build Peak is placed in the G Zone from the Vanguard Circle, you can Soul Charge 1 & Counter Charge 1. And since it has no Generation Break requirements, it’s a G Unit you can use as your first Stride. And for each of your Rear-guards, its ability grants itself an additional 3000 Power. So if you have 5 Rear-guards, you’ll be able to launch a powerful attack with Power+15000! Following up, “Holy Mage, Alessia” is a Sentinel with the Unite ability. Of course it can server as a Perfect Guard, but if you fulfill 【Unite】, you can place 1 ally Rear-guard on the bottom of the Deck, granting you Shield+15000, allowing you to Guard without using your hand. So depending on the circumstances, you can use the ability you need. And since it has the Unite ability, it works well with cards that support the 【Unite】 ability in “Raging Clash of the Blade Fangs”. As well, “Raging Clash of the Blade Fangs” has many cards that enhances 《Gold Paladin》, so be sure to enjoy. Q. Does Intercept fulfill the Call conditions for activating 【Unite】? A. No it does not. Intercept is not “Call”ing, it’s merely “Moving” between Circles, so it does not fulfill the conditions of 【Unite】. Q. During that turn, if the 2nd call to your Guardian Circle is Calling “Holy Mage, Alessia” as a Guardian, can you activate its 【Unite】 Skill? A. Yes, you can activate it. The Unite Ability, as long as you’ve called 2 or more cards to your Rear-guard Circle or Guardian Circle, can be activated.